The Stoners and Kathy Huss, Madison Scouts volunteers, "Members age out at 22 years. Volunteers don't and can be involved for a long time." April 23-29 marks National Volunteer Week. DCI.org takes a look this week at just a few of the many personalities that spend their time volunteering with drum corps. Contact any of the many drum corps out there to find out how you can become a volunteer. Name, hometown: The Stoner Family, Milwaukee, Wis. Which corps do you volunteer with, how did you get started and how long have you been at it? 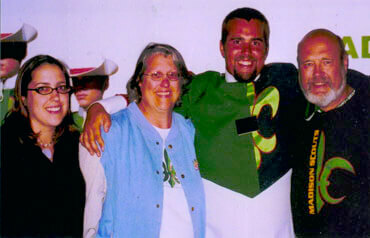 The Stoner family has volunteered with the Madison Scouts since 2002 when our son Matt was a rookie. Martha and I helped on the cook crew the first year. Since then Martha and daughter Carolyn have worked on the cook and sewing crews. In 2003, I passed the test for my commercial drivers license and have driven each year thereafter. With a background in theatrical production, I also have helped rebuild and re-plumb the cook truck, helped rebuild the equipment truck three times in four years, and built props for the guard. What is your favorite part of being a volunteer? Seeing and hearing fans express their enthusiasm for a Scouts performance and the appreciation expressed by corps members, especially the members on the Scouts horn bus. What is the most difficult part of being a volunteer? Explaining to family and friends why anyone would use vacation time to travel around the country at night, staying at schools often in remote locations or sometimes challenging neighborhoods, sleeping on classroom floors, braving 100 degree heat in Texas and Oklahoma, and eating outdoors four times a day with 175 others who are similarly inclined. Do you have any favorite memories or anecdotes from your years as a volunteer? In 2003 after driving through the night on I-90 on our way to Lynn, Mass., we were heading into the Boston tunnel at sunrise. My bus was last in the convoy and slow getting through the toll booth resulting in my losing sight of the vehicles in front. Radios and cell phones didn't work in the tunnel, and I missed the exit, which was actually in the tunnel. Exiting the tunnel it became clear we were separated from the corps and would have to resort to using the road atlas carried for such occasions. We got off I-90, and I awakened one of the members sleeping just behind me. Together we located our position and began plotting a route to Lynn. Shortly after, using cell phones, we were able to contact our transportation director who was driving the equipment truck, explained the situation and the route we planned to be on when arriving in Lynn. She said she would meet us with the equipment truck and lead us to the school. Fortunately it was early morning and traffic was very light. Our route did not constitute what could be designated a truck route, and we would have been stuck on several occasions if we would have had to share the street. We finally reconnected about a mile from the school after a number of additional calls. The memory of wandering around Lynn, Mass. with a bus and semi-trailer trying to get together on the same street stays with me. What are you most looking forward to during the 2006 season? World Championship Finals at Camp Randall Stadium in Madison on Friday and Saturday, Aug. 11 and 12. What advice do you have for those who would like to get involved as a volunteer with a corps? Just do it! The reward you experience assisting the talented, disciplined and dedicated young men and women and the staff that teaches and supports them, will be far greater than the expense. Add anything else you'd like. Members age out at 22 years. Volunteers don't and can be involved for a long time. Name, hometown: Kathy Huss, Madison, Wis. Which corps do you volunteer with, how did you get started and how long have you been at it? For the last 13 years, I have been a volunteer with the Madison Scouts. I started housing members and auditionees on camp weekends when a dear friend who had housed for many years ran out of room in her home. Some of the young men had gotten to know me and asked if it would be possible to stay at my house, and some have even lived with me for months at a time. What kind of work do you do with the corps? I still house some, but with the corps now housing together on weekends, I do little of that. Now my main focus is on being a part of the best sewing crew in drum corps. What is your favorite part of being a volunteer? Getting to know these young men and watching them grow. Too few people get the opportunity to know just how much these young people give up to participate in drum corps and how hard they work to be able to march and to make the corps the best they can be. That, and all the wonderful friendships that I have gotten from all this, they are lifetime friends. What is the most difficult part of being a volunteer? Not being able to give as much time as I would like and the time that the corps needs. Do you have any favorite memories or anecdotes from your years as a volunteer? There are really so many, it is hard to think of what to share. One of my favorite memories has to be the surprise birthday that was thrown at my house for Penny. Many of those affiliated with the corps were in on the planning and it was held on a rehearsal camp weekend. She had housed for many years before I and many were from England, Australia and of course Holland. What made it so very special is that one young man in particular from England thought so much of her that even tough he had aged out a few years before, made arrangements to fly in for the surprise. And, let me tell you, she was surprised and very happy. It's things like this that make these young men so special to so many of us. They always remember what was done for them by those of us who volunteer and help them in their time in the corps. What are you most looking forward to during the 2006 season? Seeing this group of wonderful young men march onto the field for their first show. It always gives me goose bumps. What advice do you have for those who would like to get involved as a volunteer with a corps? Do it! Any time you have is greatly appreciated by the organization and corps members. There are so many things you can do for any corps: sew, cook, drive, and much, much more! With sewing, you don't have to be an expert, there are a lot of things to be done that doesn't ever require being able to use a sewing machine. Call your favorite drum corps and ask what they can use. They need all the volunteers they can get to make things go well for the marching members. Add anything else you'd like. Being a part of this organization is one of the best things I have ever done. I'm not even going to think of telling you that there are not days when you wonder why you are doing this, but in the end, it is so worth every minute of it. These young people will thank you for a lifetime for everything you do for them. I need to thank them all for allowing me to share this time in their lives. It is very special.